The sweet aesthetic of Whimsical Floral style brings pastel colors and pretty hand-drawn flowers and leaves together to accentuate the main text. All lettering is in a hand-drawn style. The main text is a whimsical, thin-lined curly script in bright color and is accompanied by a bold serif font in soft colors, with an ultra condensed sans serif for the supporting text. A subtle background texture that looks like a combination of stone and rumpled paper, brings this style together into a charming and sweet expression of who you are. 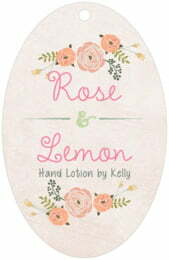 Customize your Whimsical Floral bath and body tags today! 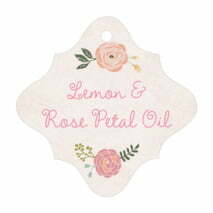 Whimsical Floral bath and body tags are printed on one side and are blank white on the back. You have the option to add text on the back for a small charge—just ask! Bath and body tags are printed on extra-thick cover weight white paper and come in a variety of shapes and sizes, including square, circle, heart, a scallop-edged circle, ovals, and other shapes. Bath and body tags come pre-punched with a small round hole to thread your choice of tying material. They are punched out individually and packaged as a set in small bags. Just choose a shape from above and then select "Personalize" to create your custom Whimsical Floral bath and body tags.